Catherine Steadman is a British actress known for her role as Mabel Lane Fox in season 5 of Downton Abbey, though I recognized her immediately as Joan Bulmer from season 4 of The Tudors. Whatever show or movie you may recognize her from, she holds her own as a novelist. 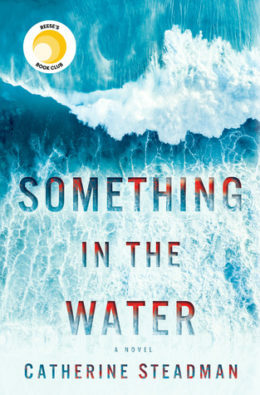 Something in the Water begins with the narrator, Erin, digging a grave. You soon realize she’s not an experienced grave-digger because she’s had to Google the most effective way to do it in a pinch. Chapter Two begins by taking us back to the beginning of Erin’s journey, when she and Mark decided to get married and how their lives went from swimmingly delightful to horrific when they find something in the water while scuba diving on their honeymoon in Bora Bora. From that moment, the tone shifts from tense to nail-biting. The audiobook is narrated by Steadman, an appropriate choice if only for the fact that she can play the part of Erin perfectly. Her voice and writing style are equally fluid, which meant all the short and long runs I went on while listening to this book were easy (a good sign). If you’re into suspense/thrillers with a strong female lead, read this one.